In recent years the convergence between film and games has been much heralded. Certainly the tools and techniques pioneered in both worlds has been used to capture actor performances and achieve photorealistic rendering and real-life camera moves like never before. 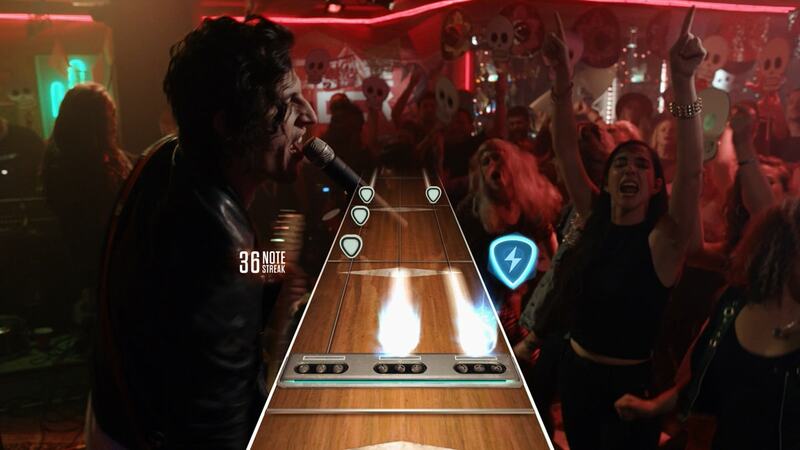 But with the new Guitar Hero Live from FreeStyleGames (FSG) and Activision, that film/games cross-over has been taken to a yet another level of co-operation. 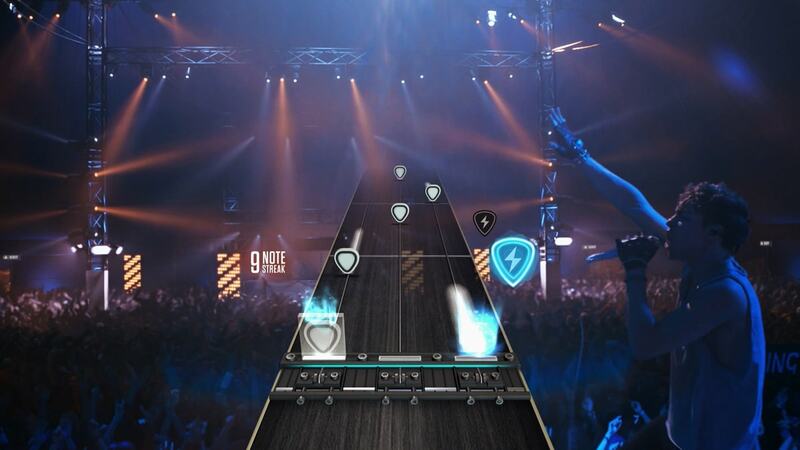 The game’s live mode now puts the player in front of filmed band members and audiences, who express both their delight and displeasure with the performance by reacting in real-time. To achieve that new style of gameplay right as the player struts their stuff, a myriad of techniques were employed. 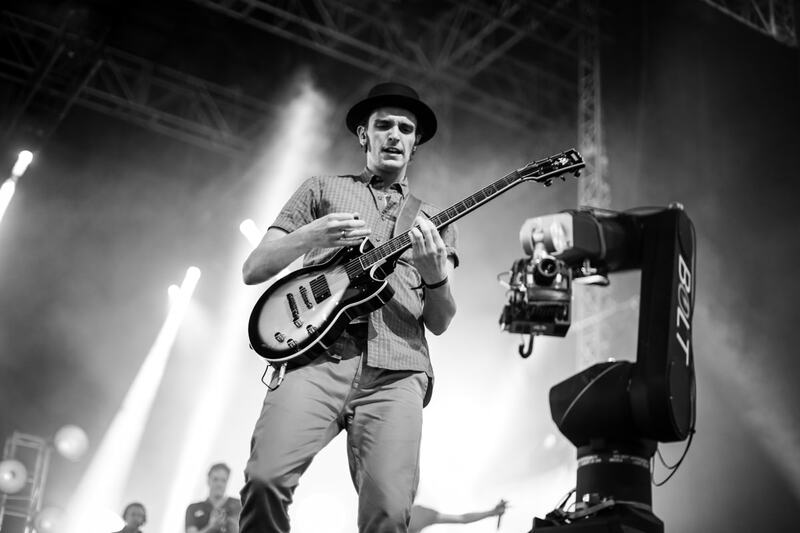 Real band members were performance captured, which then drove camera moves acquired in multiple layers on a high-speed motion control Bolt Cinebot in front of partial concert crowds. The gamemakers then called on Framestore to fill out the scenes with CG backgrounds and additional CG crowds, plus deal with transitions between the warm and cold audiences. This visual effects approach was not an insignificant feat.The resulting lengthy shots sometimes ran to 12,000 frames and saw Framestore produce more than a petabyte of data for the project. fxguide talked to key members of the teams behind the work from FSG and Framestore. 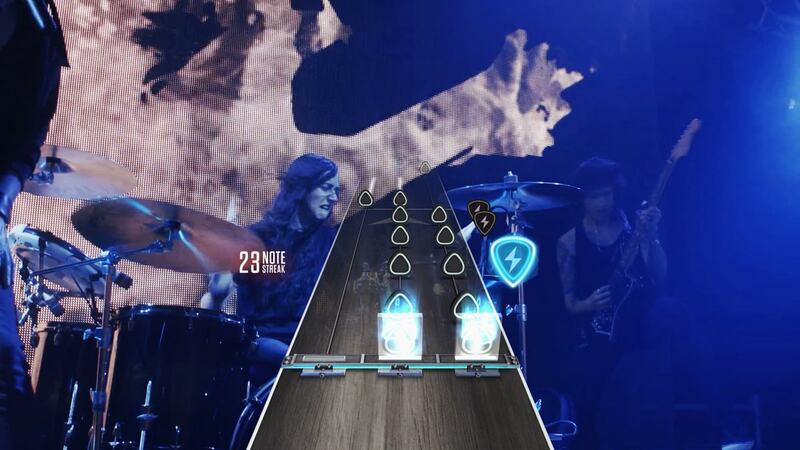 A screenshot from Guitar Hero Live shows the game highway and live action crowds. 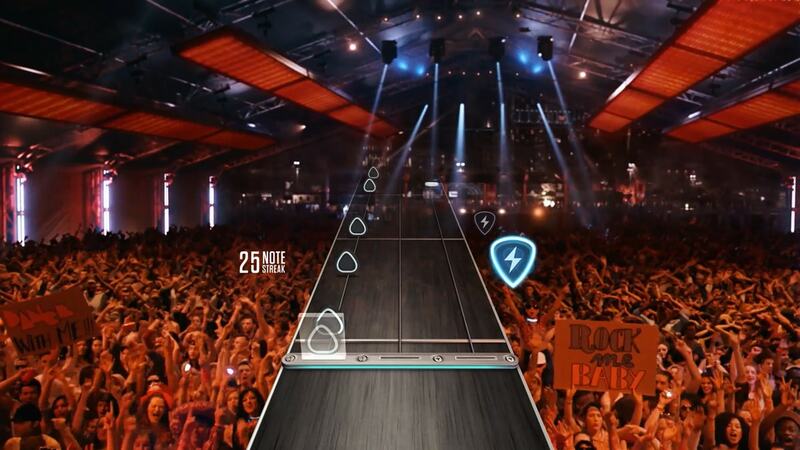 Added to this concept was the idea of setting Guitar Hero Live within the landscape of music festivals. “They’re a big part of summer here in England,” says Rutter. “So we wanted to represent that and show the different styles of music and different people all in the same place altogether.” Freestyle team members visited several festivals for reference – and ‘expensed the tickets back!’ notes Rutter. 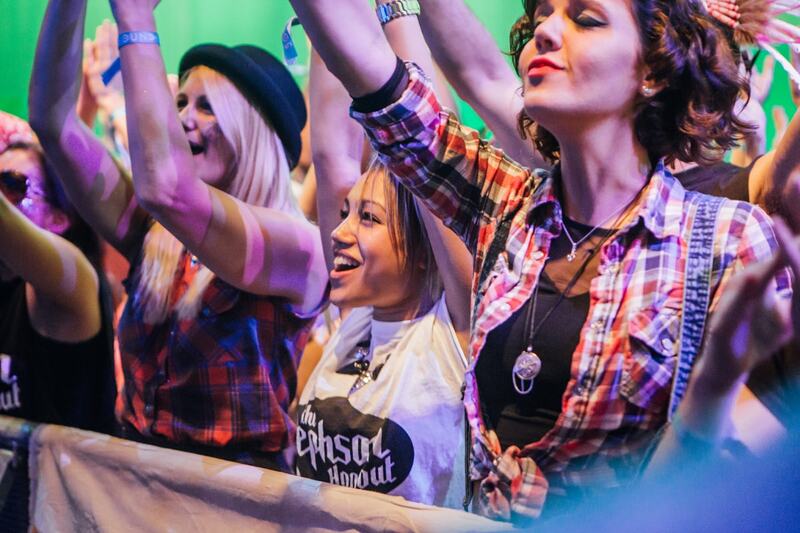 Ultimately the two festival areas became SoundArm Music Festival in the UK countryside and Rock the Block in the U.S. Shooting on set with the Bolt Cinebot. The Bolt camera enabled repeat and controllable moves. Once a methodology had been found for acquiring the live action footage, it followed a defined set of events for each song. 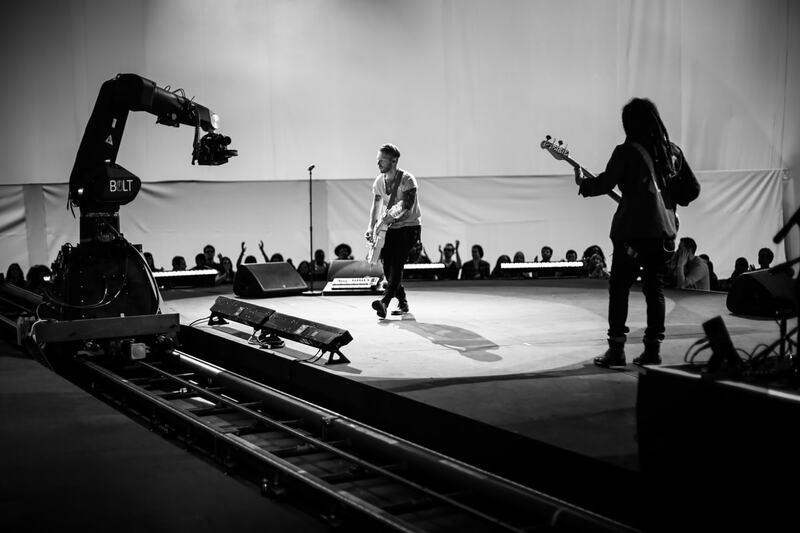 First, the band and camera operator would rehearse the performance and camera move, which were then edited into a sequence of three to five continuous song performances. Framestore extended the live action crowds with digital extras. 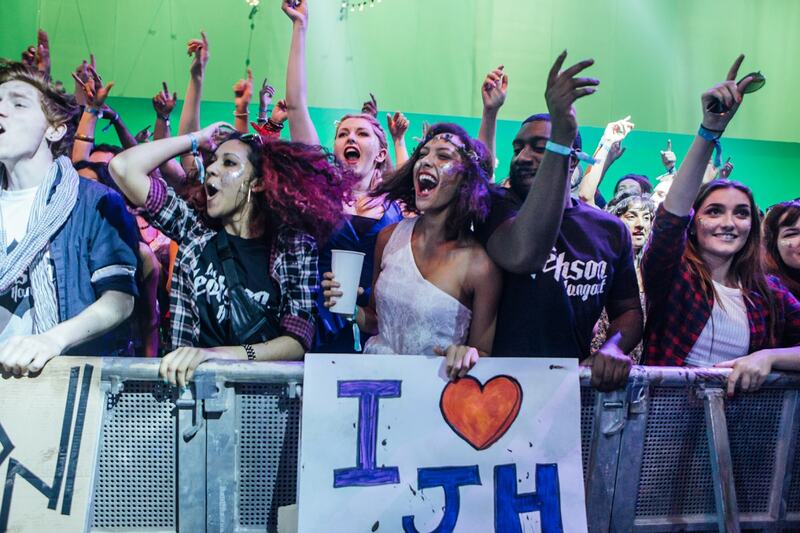 A few front rows of crowds were captured on greenscreen sets which had to play both excited and angry. Lighting the venue and the crowds became an important consideration as this is what the player would see. Interested in motion control and the Bolt rig? fxguide’s sister site fxphd.com recently filmed with a Bolt Cinebot rig at Stiller Studio in Sweden for our NUKE, Cinema4D, motion control and deep compositing VFX training courses. It looks for certain that they found the answers. Guitar Hero Live launched October 20 in the US and October 23 in the UK. There’ll also be an iOS version.